I mentioned this a couple weeks ago but for the benefit of those who missed it, tomorrow, October 21, is Back to the Future Day. It's so named because it's the date that Marty, Doc, and company arrive from the dark days of 1985 to set the universe right. To commemorate the big event, the movie makers at GTA Series Videos have recreated the "temporal experiment number one" scene in Grand Theft Auto 5 using the Rockstar Editor. 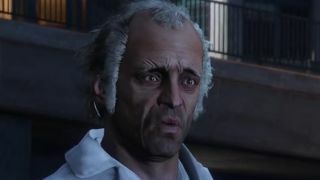 The video uses the audio from the film, as well as several mods, including the Back to the Future Time Circuits Mod 0.2, the Back to the Future—Delorean Time Machine (3 Car Pack), the Simple Trainer for GTA V 2.4, and "other modifications made by GTA Series Videos." The result, aside from the character's faces (which are understandably off-base), is just about perfectly dead-on. Speaking of Deloreans, temporal distortions, and October 21, Psyonix is releasing a Back to the Future-themed car pack for Rocket League tomorrow. It's going to be a big day.